What is the difference between a mediocre travel and tourism brand and a luxury brand? Previously I divulged that my number one tip to a truly fantastic, high-end, effective travel and tourism branding is to infuse the essence of YOU into all that you do. You head to Pinterest to create your mood board and look for inspiration. You brainstorm the features that set your business apart from the rest of the competition. Yet, when it comes time to create your new and improved travel marketing and brand style guide, you find that your creativity bank is stuck at a whopping balance of zero. We’ve all felt this stuck feeling before. That’s why I want to inspire you with some of my favorite travel & tourism businesses who are EXCELLING with their brands. The creme de la crème if you will. We’ll dive into what these travel companies are doing right—and why it works to create an impactful, effortless and memorable brand. A brand that always converts leads into customers. Beautiful photos are not only the key to a fantastic website, but choosing the right images are essential for creating deep connections with your ideal client and customers. This is especially important for the travel and tourism industry where people want to see what their experiences will be like before their trip. If a picture is worth a thousand words, then let yours do the talking. Just be sure you choose the right high-resolution images that will resonate with your target audience. Hire a photographer or use quality stock images that are relevant and similar to what your clients will experience themselves. It should be easy for potential clients to see EXACTLY what you’re offering, what you’re about and what sets you apart. Don’t overdo your branding with too many colors, fonts, taglines, etc. But at the same time, don’t leave your audience guessing or confused about what it is you offer and stand for. Finding the right balance will likely leave you with a beautiful, stunning website that will attract clients near and far. Hire a professional who has experience in travel and tourism marketing and branding. We touched on this before; you can get a refresher here if you need to. This is one of the most important aspects of developing a powerful brand. All of the travel and tourism businesses below are extremely consistent across all of their platforms (website, social media, marketing, etc. ), and the result is a beautifully irresistible brand everywhere. This is probably my FAVORITE tourism site ever. Their branding is fantastic—so consistent, so clear. Well-thought out. Read their tagline above, and it is immediately evident what sets impeccable Butterfield and Robinson apart from all the other tour operators out there. This theme of slow and insightful travel is dominant throughout their social media platforms, blogs, and all website pages. What’s more, Butterfield and Robinson is consistent and true to their brand clarity throughout all of their tour offerings. You can travel almost anywhere in the world with Butterfield and Robinson and know you will experience relaxed-pace, stylish, off-the-beaten-track travel with each journey. Their branding says it all. 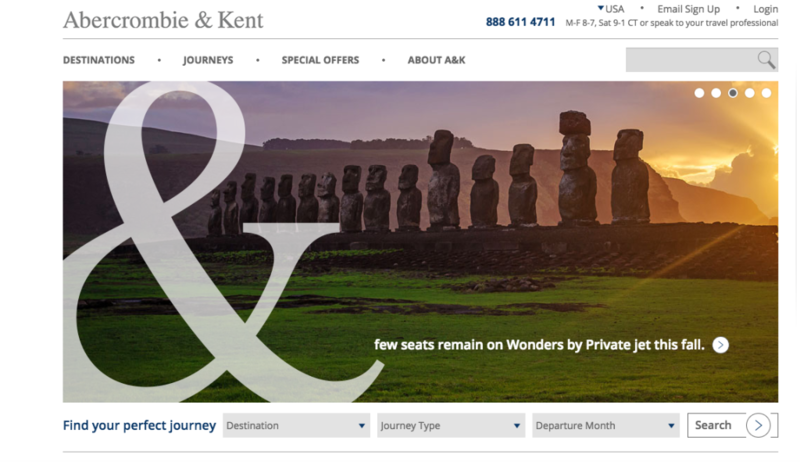 Abercrombie & Kent is a master at invisible branding. Everything about their brand is simple and sleek, from the font to the giant, expensive touch of the ‘&’ logo to the use of open white space. As a high-end luxury tour operator, this direct simplicity is their signature. Abercrombie & Kent’s target customers know they are going to get clean, chic luxury on all of their journeys—just like the experience they have with the brand online. Perhaps one of the most beautiful sites on this list, WildChina does a fantastic job of letting their photos speak for their brand. WildChina is ‘committed to making the real China accessible’; their stunning images back up this claim immediately, breaking down perceived travel barriers before you even leave your chair. WildChina also has a clear website that is easy to read and navigate, and they do a beautiful job at displaying their awards as pictured above. 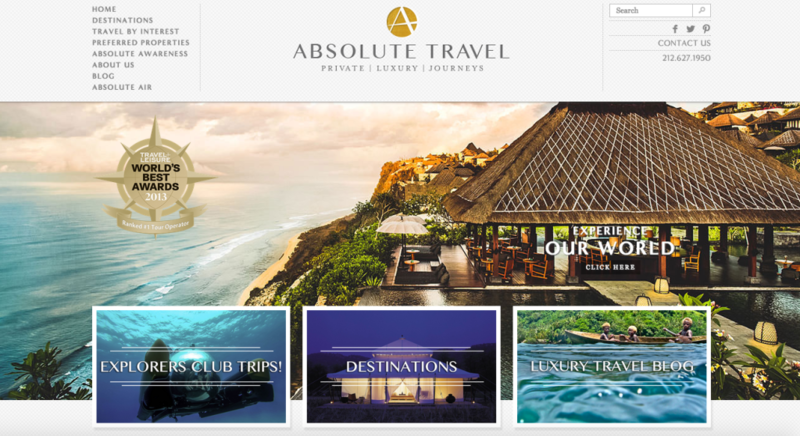 Absolute Travel has a stunning style that they execute seamlessly on their website and consistently carry over to their blog. You’ll notice there are only two fonts—a signature (accent) font and a primary font—which is something I always recommend to my clients. 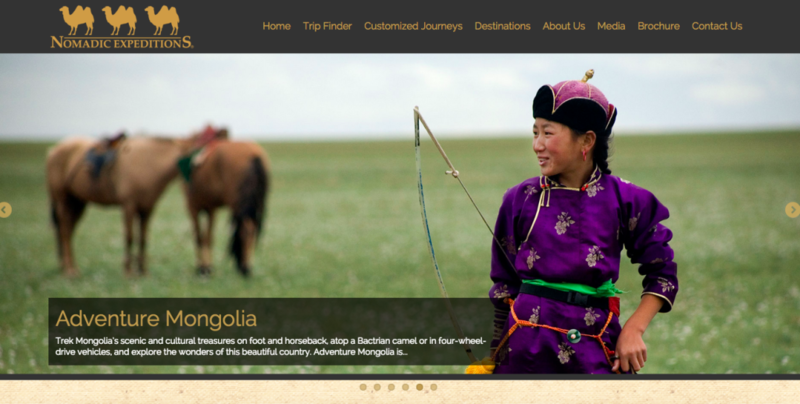 Navigating their website is a luxurious experience, just like the private tours they offer. Easy to read and everything is ‘above the fold’ before you scroll, which is a perfect symphony to my eyes & the user experience. Nomadic Expeditions exemplifies how a well-thought-out color palette, evoking the feeling of sand and desert adventures, can provide the perfect tone for your offerings. Their website is sleek, their font consistent, and their mission clear. I know immediately what Nomadic Expeditions is about and if I (the consumer) am in the right place. It’s a branding job well done from start to finish. These are just a few of the travel and tourism companies out there who have taken the time to thoughtfully build their brand the right way. And as you can see, the result is well worth the effort! Travel marketing and branding should be an integral part of your vision board. Master these and you’ll be rewarded with an abundance of your ideal customers, greater credibility, and a higher perceived value. Who doesn’t want that? These are my favorite travel and tourism businesses who are excelling at showcasing their branding to make more sales. Now, tell me yours. Share in the comments the travel and tourism brands that you think have an impactful and effortless beauty! Especially if they inspire you.